Well this doesn't happen often. I think I have found a new favourite restaurant in Brighton (certainly top three anyway). I almost don't want to tell you about it! Open for a mere few weeks, I had been hearing great things about the Little Fish Market Restaurant, tucked in the residential streets near the Old market venue. Formerly a Fishmongers, Duncan Ray has taken it over as his new restaurant (keeping the name and the branding which may have confused people a little - it's nothing to do with the former business). And it's good. It's REALLY good. Beautiful, fresh food, refreshingly served up simply, yet elegantly, minus any cheffy nonsense of scattering your food around the plate so one piece of potato is a 5 minute drive from the other. Ray, despite his impressive CV, wants to feed you not his ego here and God love him for that. The interior suits the food and the location. Well considered and designed, smart yet relaxed and understated in modern beachy tones. Perfectly matched to the food. Fish is obviously the dish of the day here and Brighton sure as hell needs more decent fish restaurants. You'll find a meat option or two but vegans and "proper" vegetarians will struggle here. 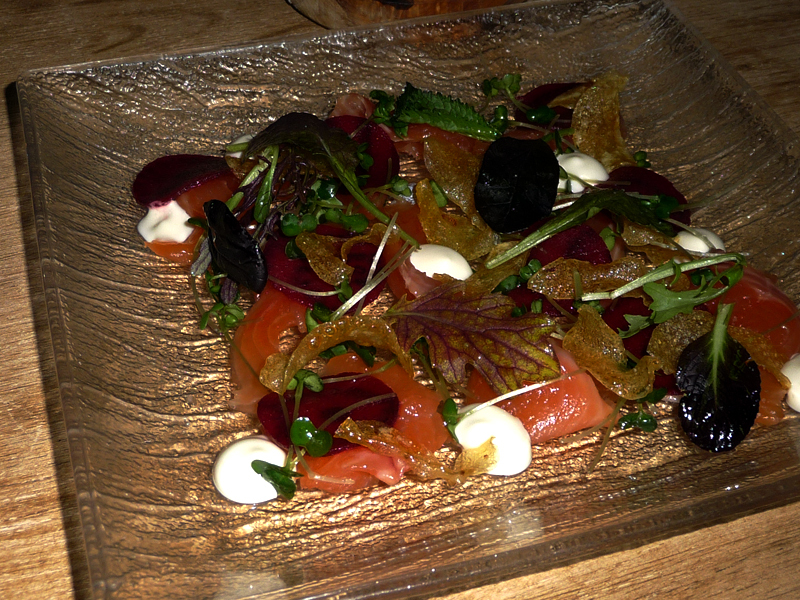 My Smoked Trout Salad was a perfect starter, light and interesting. I loved the pretty discs of beetroot, the contrast of the freshness of the salad and the smoke of the fish with spikes of horseradish. Nice slithers of trout too which were pleasant to eat as I'm not one for great hunks of raw textured fish. The paper thin shards of crisp potato were something new to me and made the dish so interesting texturally. Mr GF's fish soup with little brown shrimps and chunky cubes of soft hake was lovely too and gobbled up with the homemade bread and hand churned butter. Starter sizes were spot on as we were really revved up for the main courses. 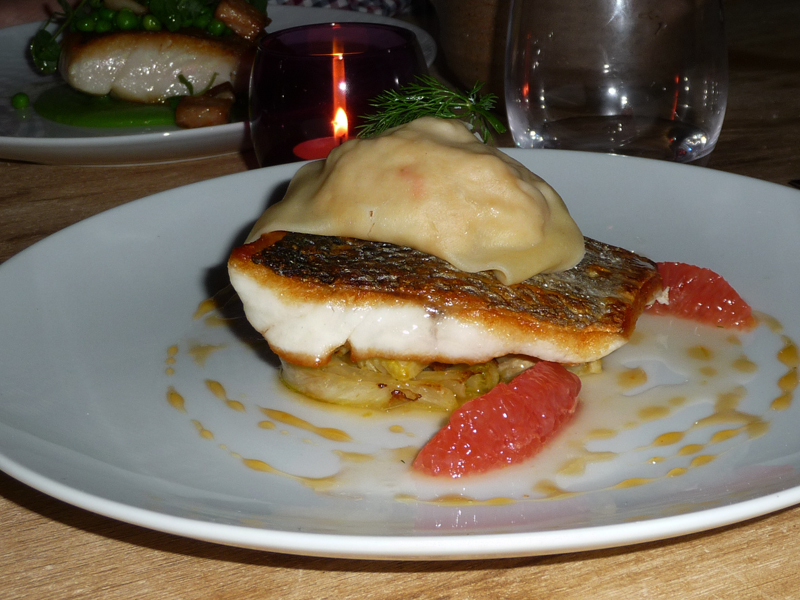 I chose the Seabass with Fennel and Pink Grapefruit with a Crab Ravioli. The way the ingredients of this dish were treated realy allowed the gorgeous buttery seabass to deservedly shine. The fennel and grapefruit made it a light (and actually quite feminine) dish. The pasta of the ravioli was thin and toothsome, and held a decent portion of soft crab. I'm smilimg as I write this as it's one of those dishes that sticks in your mind, not for gimmicks or showmanship, just for beautiful, memorable tastes, executed absolutely perfectly. 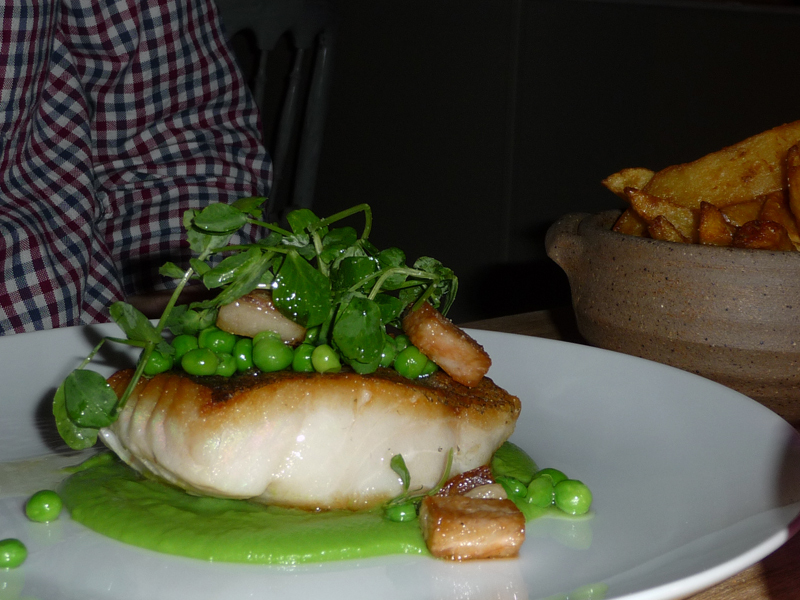 Mr. GF was clearly on a hake bender with his Hake, Pea Puree, Bacon and Mint dish. Peas, bacon and fish are a winning combination and they got first place here. As with mine, the textures were great. This is the style of food presentation I really like. The duck fat chips were crisp and moorish. Essentially this was a Rolls Royce version of the classic Fish and Chips, again, elegantly presented. 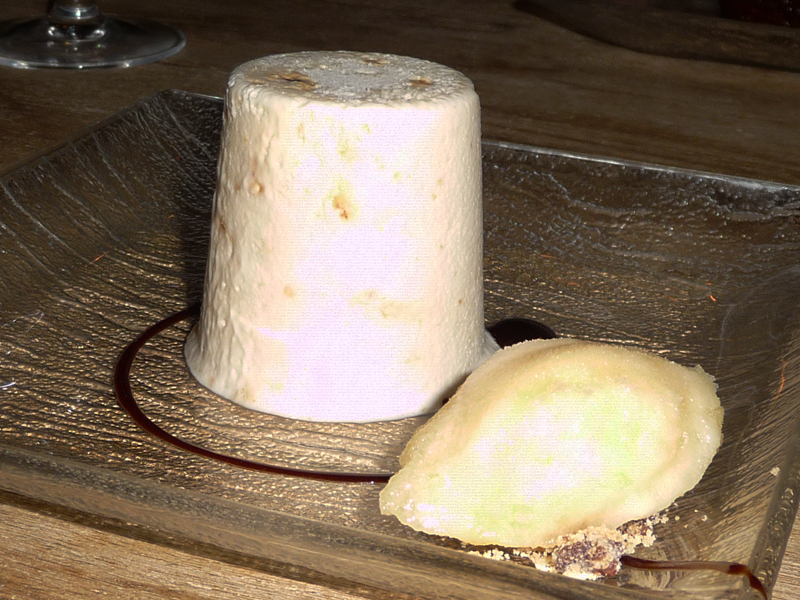 I enjoyed my frozen hazelnut meringue dessert. After my light and fresh meal a heavy or overly chocolaty pudding would have been a bad choice so this was just the ticket. Delicate and satisfied my need of a sweet treat to finish. Again, textures kept things interesting; some element of crunch and crumb to contrast the smooth frozen ones. The passion fruit sorbet was excellent and all of the desserts seem to come with a serving of home-made ice cream in different flavours like gingercake or banana. The miniscule spoonful of tarte tatin I mananged to wrestle from my husband (the bit of our marriage about sharing our possessions went out the window here) was a darn, darn good example. 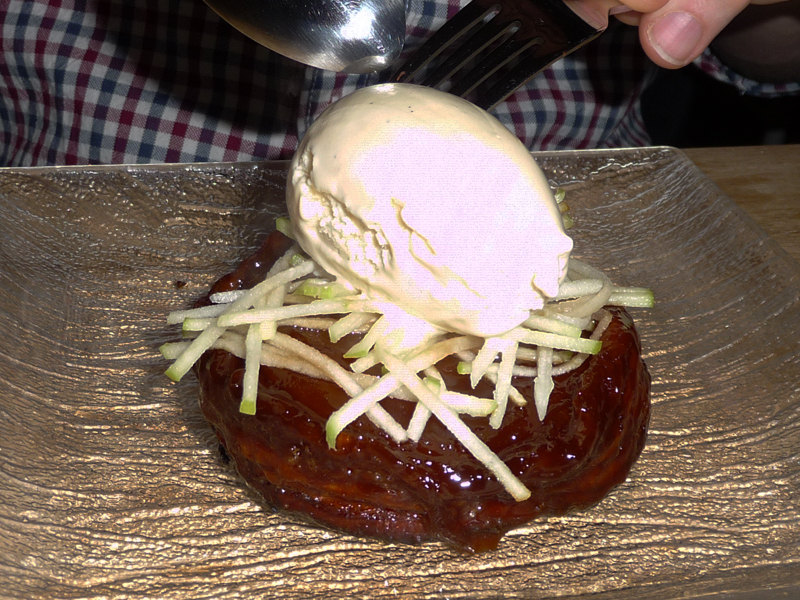 I thought the raw shreds of fresh apple were a nice touch and texture combination with the caramelised gooiness of the tarte tatin. When we visited, they were still in the process of getting their booze licence so it was BYO, but this is now in place and they have a good wine selection to choose from. Worth noting is that it is still cash only payment. Prices were good for what's on offer here. Some fish can be expensive but starters and desserts were around the £6 mark and mains £12-18. When you concider a rack of ribs in one of the generic chain restarant is hitting the £16 mark these days, i say the prices here are more than fair. If they keep the new wine list sensible then this place is incredibly good value for money. Although not on the main streets on Brighton, I like the fact it is a bit of a hidden gem, and if a restaurant is good, people will come, so I'm sure the 20 odd covers will be filled no problem. With such great cooking, passionate people and wonderful produce, I just know that The Little Fish Market Restaurant is going to be big.